Binary options are a type of online trading, where you as a trader predict thru web or mobile platform, whether the price of a certain underlying asset will go up or down. Under the term – underlying assets we have in mind stocks of major companies like Google, Microsoft, FB…, currency pairs, indices and commodities (silver, oil, gold…). If your prediction is correct you earn a fixed amount that you know before placing the investment. In most cases, returns from binary trades range from 170% to 192% per trade. So if you invest $50 you get an additional $35 – $46 to your initial investment. To create one trade you can invest as small as $1. Beware, though at first glance it may look simple, binary options trading is not as easy as some portals may and do say. It is possible to make a lot of money, but it’s also possible to lose a lot. An investor who does not have any previous experience with the market and does not plan to acquire it can expect a great loss. To succeed in binary trading it is essential not to be naive and not to fall for scams that promise “bulletproof systems that will make money in your sleep” which are hiding behind every corner. What my profit will be like? Where do we trade binary options? With what capital should I trade binary options? What reliable binary brokers we have tested and we use for our trades. How to create a demo account for trading with virtual money. In our first step, we choose an asset we want to trade. In our example, we chose the currency pair EUR/USD with an 89% return from a successful trade. The choice of an asset is up to you. There are about 200 underlying assets which we can trade, each asset has different profitability. In the second step, we decide, when our trade should end and evaluate. So, if we want our trade to end in 30 minutes, then we select an expiration time of 30 minutes. Subsequently, we choose how much we want to invest in this particular trade. When we trade classic binary options we can invest only as little as $1. Now, we have moved to the most important part of trading at which we have to decide, whether the price of our option will go Up, or Down. When you trade classic binary options, only one of these three situations can occur. Either your trade will be successful and you receive a predetermined profit, which in our case would be $50 + $44.5 = $94.5. Or the trade will end up unprofitable and you lose the invested amount (the biggest amount you can lose equals to the investment in this particular trade). The third situation occurs very rarely and we can meet with it when the price doesn’t change at all (price of the option when we entered the trade is the same as in the moment when the option expired). In this type of situation, most brokers give the investment back to the trader. As you’ve probably noticed we get from correct prediction only 89% extra money from the invested amount. So, you might ask “How could possibly binary options be such a good extra income?”, when you don’t even earn 100% from what you have invested. The main reason behind this is because you can use binary strategies, which can significantly help you to create a majority of successful trades. Please bear mind that even with strategies no one can accurately predict the market and make all trades winners. Without binary strategies trading would be just a hazardous game that has nothing in common with meaningful and responsible investing. It depends entirely on you. With the right binary strategy, you can boost your capital by a few dozens of percent in a week. Equally, with a bad strategy or without a strategy you can just as quickly lose it. The basis is to be as patient as possible and to hold to your selected strategy, which you know that works (for example from a demo account). Binary options trading is about a long-term profit and not about making one (or even a row of) successful or unsuccessful trades. Any kind of trading or investing is risky and you have to count with that. If you enter the world of trading you should invest only such amounts that you can afford to lose. Some fraudulent servers (or even scams) may encourage you to borrow money from your friends or family members, if necessary because it is a guaranteed thing that your investment will return. But we are a serious portal and we most certainly do not advocate such claims. Although binary options have a great advantage that the risk is eliminated only to your investment into the trade, we, binary traders still operate on a financial market. And there are no guarantees. The market is merciful only to those who are prepared and know the risks. For instance, traders who do not apply any trading strategy can most likely expect to lose their capital. A great advantage of binary options is that if the price changes only by a single pip in your direction, you receive a full profit from the trade. Let’s look at an example. You entered a trade at a moment when the oil price was set up to a value of 1.5797 and you have selected the expiration time of 30 minutes and upwards direction. A 30-minute trade ended at the price 1.5798, thus it changed only by a single pip you will still secure for your correct prediction full profit from the trade. It is because in binary trading doesn’t matter, how much the price changes, but if it changes in the direction you chose. The term „broker“ was already mentioned in the article. But do you know, who this broker really is? A binary broker is a company that arranges the transaction between a buyer and a seller. It is basically a place where demand meets supply. Here, you can trade. Every broker has its own web platform, so no downloading is required. There are dozens of brokers or even hundreds of them. If you are looking for a reliable and trustworthy broker who cares about their traders you need to look for certain aspects. One of them is a broker’s credibility, which can be gained by a reputation among traders and by licenses. A license is obtained by a broker in exchange for a large fee to the regulatory authorities. These authorities are responsible for constant supervision over the broker and over all their actions. Apart from credibility, we should focus on payouts, a minimum deposit, and a minimum investment. We should also find out whether our broker provides a demo account if we plan on using it. Traders who do not speak English can also appreciate a trading platform and customer support in their native language. On our website, you may find many brokerages reviews. Currently, as the best option is from our point of view IQ Option, a regulated binary broker with superior payouts and a free demo account. General warning: When trading with real money, your capital is at risk. To see whether you can be classified as a Pro trader read this page. All recommended brokers went thru our testing process. In a 3 month time period, we act as a regular trader and we actively create trades as any other trader would. If we find out any problem with the broker, we mark him as „not recommended“ or even as a „scam“. The fact that a broker makes it to the selection of recommended brokers does not necessarily mean that it will stay there forever. In case that the broker is not capable of maintaining high-quality services as on the beginning, we reduce the rating of the broker on the website or we even completely remove it from the list of our recommended brokers. Some newbies try to do this by guessing and they usually determine the future price direction just according to the chart which is provided to them by the broker. I would not be afraid to state that such trades are completely random and made without using any strategy. But that is not the way we trade at TradingBeasts.com, we know that in order to become a successful trader who makes a long-term profit you most certainly need binary strategies. Without any trading strategy, every binary trader has got half a chance to create a successful trade, because when trading classic binary options we have to only predict whether the price of an option will go up or down. That is, however, with 75-85% returns from a successful trade simply not enough and trading without using any binary strategy can never be profitable (or at least not in the long run). A binary strategy can significantly help us to increase our win. ratio and put the odds in our favour. Following a strategy also allows you to constantly improve your results because all the trades you create have a meaning and they were built on the basis of a specific pattern. Which means you can repeat them, results which can be achieved again usually mean success. We have 2 types of strategies which we sometimes also call analysis. The first one is called technical analysis, the second one fundamental analysis. Some strategies might combine both of these analysis types. Technical analysis or the analysis of graphs engages in forecasting prices according to a repetitive pattern (formula). In order to find these patterns, we use different kinds of indicators and oscillators (such as the stochastic indicator, MACD, RSI and many more). Some brokers offer on their trading platforms a system that can be used for complete technical analysis (One of such companies is e.g. IQ Option that has in-house built charting system). In case you seek a free service which focuses just on technical analysis, we would like to recommend you investors’ most popular analysis platform – MetaTrader 4. Here is an example of the MT4 with a 5-minute chart. The second type of analysis is fundamental analysis. This method focuses exclusively on economic statistics and economic changes which will most likely affect the value of assets. When we look at some large scale examples, then we most certainly have to mention the global crisis in 2008, in which investors had a great chance to invest on the drop of public securities of major companies, banks and investment funds etc. On a smaller scale, hundreds of economic news are daily published (eg. unemployment and interest rates, inflation etc.). All of these and many more announcements are recorded in the economic calendar. These calendars include information about the impact of the news, time of their release, and the forecasted direction in which the price will most likely move. There are hundreds of economic calendars which are available on the Internet. One is even offered by IQ Option in their academy, the calendar is located in the top menu under the “for traders” section. The first two strategy types mentioned above are designed to predict the price, the following strategy is, however, a question of correct money management. When you fully adherence your money management strategy you will be able to get the absolute maximum from your capital, so don’t take this type of strategy lightly. Generally speaking, it is not recommended to invest in one trade more than 4% of your total capital. Money management is very often overlooked, however, its importance is exactly the same as using any other strategy that will help you predict the price, sometimes even bigger. Take an example, your broker requires the minimum investment of $ 10 so you could open a trade. At the same time, the minimum deposit at such broker is $100. That means if you deposit only the minimum required amount, you risk in the very first trade 10% of your entire account funds; that is an enormous part of your whole trading wealth. So theoretically speaking, you have money to open only 10 trades. Of course, all of those trades would have to end up out-of-the-money and that is highly unlikely. Nevertheless, if even just a few of them turn out to be unsuccessful (especially the first ones), you would get yourself into a big psychological pressure. Subsequently, you begin to doubt every trade and you will most likely slip from your trading strategy, which might result in further losses. Trading with real funds without a tested binary strategy entails high risk. For this very reason, it is of crucial importance that every trader is properly prepared before entering the real market. 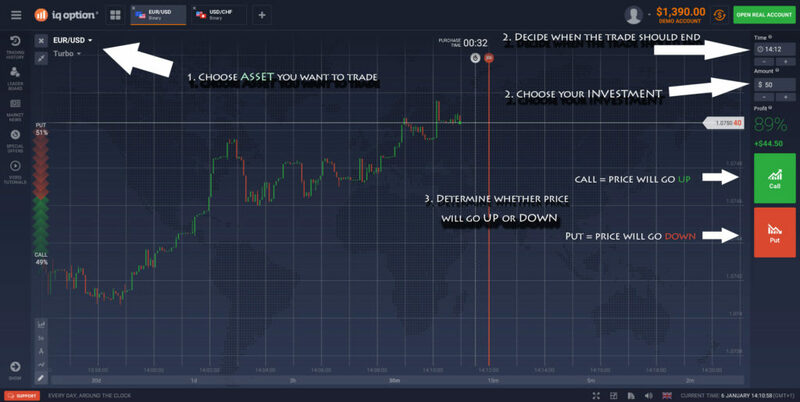 The most popular and effective way how one can prepare for real trading is using a free demo account for binary options. This practice account works exactly the same as the real one, with one huge difference, that you are trading with imaginary funds. Once you open a demo account try to strictly follow your strategy as you would with real funds. The second option, how you can test binary strategies is to open, for example, MetaTrader 4 and at the time when you would normally open a trade, you make a note either to Excel or on a paper. Then you wait if the price of the asset moves in the direction you forecasted and you write down the result of each and every one of your trades. This way you will try to “create” as many trades as possible and then you calculate the overall success of your strategy.